KE LIU, PhD, MBA, is the Principal Scientist and Project Leader of the Energy and Propulsion Technologies Division of GE Global Research Center, working on different technologies related to gasification, IGCC, syngas, and fuel conversion. Currently, he leads a team of engineers to develop the dry feeding technology for next-generation GE gasifier for high-moisture, low-rank coal and biomass gasification. Dr. Liu started his career at Exxon-Mobil and then UTC Fuel Cells, working on various fuel and H2 production technologies. He is not only a leading expert on energy, fuels, and gasification, but also an industrial leader who led many large R&D projects funded by DOE and large U.S. energy corporations such as GE, Shell-UTC, and Exxon-Mobil. A recipient of numerous awards, including the 2006 National Emerald Honors Special Recognition Award, Dr. Liu has served as a board member and program chair of International Pittsburgh Coal Conference, a board member of the Energy Center of CalTech (PEER), and the associate editor of the Energy and Fuels Journal. CHUNSHAN SONG, PhD, is a Professor of Fuel Science and Chemical Engineering and the Director of the EMS Energy Institute at Pennsylvania State University. A recipient of numerous awards, he has been extensively published, and his research on clean fuels and catalysis has been funded by government and industry. Also, Dr. Song has served as chair for the ACS Division of Petroleum Chemistry; chair for ACS Fuel Chemistry Division; and advisory board chair and program chair for International Pittsburgh Coal Conference. VELU SUBRAMANI, PhD, is a Research Scientist working for the BP Refining and Logistics Technology team. He has over fifteen years of research experience in heterogeneous catalysis for fine chemicals synthesis, energy production, and environmental protection. He is the recipient of research fellowships from Switzerland and the Science and Technology Agency (STA) of Japan. Dr. Subramani is the author of over fifty peer-reviewed articles in international journals and the author or co-author of several patents. He served as the program chair for the ACS Division of Fuel Chemistry. 1. 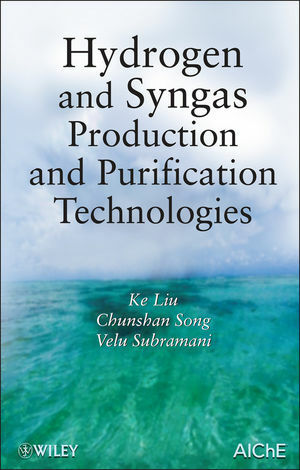 Introduction to Hydrogen and Syngas Production and Purification Technologies (Chunshan Song). 1.1 Importance of Hydrogen and Syngas Production. 1.2 Principles of Syngas and Hydrogen Production. 1.3 Options for Hydrogen and Syngas Production. 1.4 Hydrogen Energy and Fuel Cells. 1.5 Fuel Processing for Fuel Cells. 1.7 CO2 Capture and Separation. 1.8 Scope of the Book. 2. Catalytic Steam Reforming Technology for the Production of Hydrogen and Syngas (Velu Subramani, Pradeepkumar Sharma, Lingzhi Zhang, and Ke Liu). 2.2 Steam Reforming of Light Hydrocarbons. 2.3 Steam Reforming of Liquid Hydrocarbons. 2.4 Steam Reforming of Alcohols. 2.5 Carbon Formation and Catalyst Deactivation . 2.6 Recent Developments in Reforming Technologies. 3. Catalytic Partial Oxidation and Autothermal Reforming (Ke Liu, Gregg D. Deluga, Anders Bitsch-Larsen, Lanny D. Schmidt, and Lingzhi Zhang). 3.2 Natural Gas Reforming Technologies: Fundamental Chemistry. 3.3 Development/Commercialization Status of ATR, POX, and CPO Reformers. 3.5 CPO Mechanism and Kinetics. 3.6 Start-Up and Shutdown Procedure of CPO. 3.7 CPO of Renewable Fuels. 4. Coal Gasification (Ke Liu, Zhe Cui, and Thomas H. Fletcher). 4.2 Coal Gasifi cation History. 4.6 Classification of Different Gasifiers. 4.7 GE (Texaco) Gasification Technology with CWS Feeding. 4.8 Shell Gasification Technology with Dry Feeding. 4.10 Challenges in Gasification Technology: Some Examples. 4.12 Integration of Coal Gasifi cation with Coal Polygeneration Systems. 5. Desulfurization Technologies (Chunshan Song and Xiaoliang Ma). 5.1 Challenges in Deep Desulfurization for Hydrocarbon Fuel Processing and Fuel Cell Applications. 5.4 Post-Reformer Desulfurization: H2S Sorption. 5.5 Desulfurization of Coal Gasification Gas. 6. Water-Gas Shift Technologies (Alex Platon and Yong Wang). 6.3 Industrial Processes and Catalysts. 6.4 Reaction Mechanism and Kinetics. 6.5 Catalyst Improvements and New Classes of Catalysts. 7. Removal of Trace Contaminants from Fuel Processing Reformate: Preferential Oxidation (Prox) (Marco J. Castaldi). 7.3 General Prox Reactor Performance. 8. Hydrogen Membrane Technologies and Application in Fuel Processing (David Edlund). 8.2 Fundamentals of Membrane-Based Separations. 8.3 Membrane Purifi cation for Hydrogen Energy and Fuel Cell Applications. 8.4 Membrane Modules for Hydrogen Separation and Purification. 8.6 Integration of Reforming and Membrane-Based Purification. 9. CO2-Selective Membranes for Hydrogen Fuel Processing (Jin Huang, Jian Zou, and W.S. Winston Ho). 9.2 Synthesis of Novel CO2-Selective Membranes. 10. Pressure Swing Adsorption Technology for Hydrogen Production (Shivaji Sircar and Timothy C. Golden). 10.2 PSA Processes for Hydrogen Purification. 10.3 Adsorbents for Hydrogen PSA Processes. 10.4 Future Trends for Hydrogen PSA. 10.6 Improved Hydrogen Recovery by PSA Processes. 11. Integration of H2/Syngas Production Technologies with Future Energy Systems (Wei Wei, Parag Kulkarni, and Ke Liu). 11.1 Overview of Future Energy Systems and Challenges. 11.2 Application of Reforming-Based Syngas Technology. 11.3 Application of Gasifi cation-Based Syngas Technology. 11.4 Application of H2/Syngas Generation Technology to Liquid Fuels. 12. Coal and Syngas to Liquids (Ke Liu, Zhe Cui, Wei Chen, and Lingzhi Zhang). 12.1 Overview and History of Coal to Liquids (CTL). 12.2 Direct Coal Liquefaction (DCTL). 12.3 Indirect Coal to Liquid (ICTL). 12.4 Mobil Methanol to Gasoline (MTG). 12.8 Coal to Dimethyl Ether (DME).